This easy to follow ekmek kataifi recipe never fails to impress and is always a crowd pleaser. 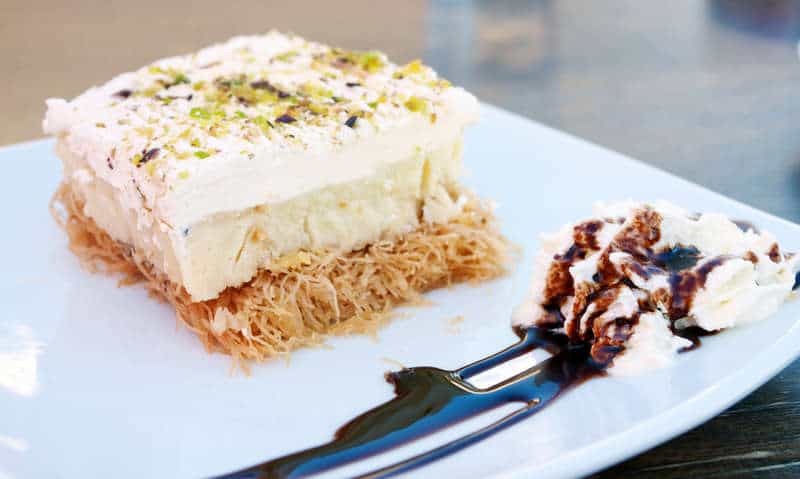 The essence of this traditional Ekmek kataifi recipe can be summarised in three key stages: preparing the syrupy kataifi base, preparing the creamy custard and preparing the airy whipped cream. Each stage will require using quite a few pots and pans, but i think you will agree that the end result is well worth the mess! The creamy custard is the most essential part for a traditional Greek Ekmek Kataifi recipe and probably the trickiest part too. To achieve the perfect texture the key is to constantly whisk the milk while it is boiling, so that it doesn’t get lumpy. The perfect custard for your ekmek kataifi should be smooth and creamy. Prepare the custard over medium-low heat in order to prevent it from burning and sticking on the bottom of the pan, but be cautious not to undercook it. Give it a taste while stirring. Its ready when you can’t taste the flour and its texture is thick. To prepare the whipped cream for this traditional ekmek to perfection, chill a clean bowl along with the whisk attachment from a stand mixer in the freezer for 10 minutes and make sure that your whipping cream is very cold. Be careful not to over beat the cream or else it will become like butter. It is very important to defrost the kataifi dough overnight. The secret is to let it defrost in the fridge and not at room temperature as this will prevent it from getting soaked with melting ice water. When it comes to buttering, don’t be thrifty! Drizzle with enough butter to help the dough bake and get a golden brown colour. Plus butter adds plenty of extra yummy flavour! Kataifi dough is actually shredded phyllo dough and dries out very quickly, so it’s best to keep exposure to the air at a minimum. Work the dough gently with your hands on a large surface or over the sink, so that you don’t end up with a kitchen filled with scattered shredded dough, drizzle with butter and straight to the oven! The key for the most flavorful homemade Ekmek Kataifi is to use good quality fresh butter for buttering. The authentic Greek ekmek kataifi recipe calls for ‘galaktos’ butter made from cow’s milk, which really gives a unique flavour and amazing smell! The base for the ekmek kataifi should be crispy and moist at the same time. To achieve that it is important that you bake the dough very well until its crispy and nicely golden, or else it will become mushy when pouring the cream over it. Ladling with the syrup is the final “gotcha” to this dish. Make sure that the syrup is lukewarm and your ekmek kataifi is cold. Always ladle the syrup over the cold pasty really slowly, enabling each ladle to be absorbed, so that the syrup is spread our evenly through the dough. And the final step… Even though it will be really difficult to follow, you should wait for the ekmek kataifi to cool in the fridge for at least 2 hours for a before serving! So go ahead, give this traditional Ekmek Kataifi recipe a try and indulge yourself to this little sin! And don’t forget to share this recipe with your friends and family using the social sharing buttons above and at the end of this recipe! To prepare this traditional Ekmek kataifi recipe start by making the base. Preheat the oven to 170C and unroll the kataifi dough from the plastic sleeve. Work the kataifi dough with your hands, tearing apart the shreds and spreading the strands out a bit if they clump together, in order to get fluffy. For this ekmek kataifi recipe you will need a 25cm square non-sticking baking dish. Butter the bottom of the baking dish and spread the kataifi dough to form the base of the ekmek kataifi. Pour over the melted butter and bake in preheated oven for 30-45 minutes depending on your oven, until crispy and nicely coloured. In the meantime prepare the custard for the ekmek kataifi (steps 2-4). Add in a large bowl the egg yolks with half the sugar (100g) and whisk until fluffy. Add 3-4 tbsps of the milk and the corn starch and whisk again until the corn starch has dissolved. Set aside. Pour the rest of the milk in a large non-sticking pan and add the sugar and the vanilla extract. Place the pan over high heat and bring to the boil. As soon as the milk comes to the boil, remove from the heat and ladle gradually 1/3 of the milk into the egg mixture, whilst whisking. Place the pan (with the remaining milk) again on the stove and turn the heat down to medium. Add the egg mixture into the pan with the remaining warm milk. Whisk continuously, until the mixture has thickened and is smooth and creamy. Remove the pan from the stove, add the butter and stir. Pour the custard in a large tray, cover with some plastic wrap (the plastic wrarp should be touching the custard, so that it doesn’t form a crust) and let it cool, while you prepare the rest of the ekmek kataifi recipe. Turn the kataifi out of the oven and let it cool down completely. Prepare the syrup for the ekmek kataifi. Add all the ingredients for the syrup into a small pot and bring to the boil. Simmer the syrup of 3 minutes (without stirring), until slightly thickened and remove from the stove. Leave the syrup aside to cool down for a while, until lukewarm. Ladle slowly the lukewarm syrup over the cold baked pastry, enabling each ladle to be absorbed. Set aside to cool down for a while. Prepare the whipped cream and assemble the ekmek kataifi. Top the kataifi base with the custard and even out using a spatula. Put the cold heavy cream into a mixer’s bowl, add the icing sugar and whisk on high speed until medium peaks form, about 1 minute. Top the ekmek kataifi with the whipped cream and even out. Sprinkle with the chopped pistachios and a pinch of cinnamon. Store the ekmek kataifi in the fridge and serve cold. Enjoy! That is Turkish dessert. Even the word is Turkish. Would you please stop labeling everything Greek! i am afraid it is Greek! ITS NOT GREEK ITS TURKISH STOP STOP STOP SAY EVERY THING IS GREEK. Don’t worry about it. Let them to be happy :). it’s as turkish as Agia Sophia!!!! NOT!!!!! It’s Greek though. As Athena already said it: It comes from the Asia Minor Greeks who lived there much longer before than the Turks even did though our cultures have blended ways. To you my uneducated friend. Read upon the delights of Byzantium before the Ottomans came. Then you will know that countless of recipes already existed in Greece, from sweets to savory. There have been many layered dishes even all the way to classical Greece, 1500 years before the Turks even came close to Anatolia, the land you stole which you call Turkey today. We all know that Turks are from Mongolia/Central Asia right? Did you know that these regions where you come from that the cuisines are incredibly POOR? I mean very very poor. Most of the Turks still living in these regions have most of their nutrition/food coming only from their cattle/animals. While most ingredients in Greek cuisine has been around for thousands of years in Greece and Mediterranean. Turks where the last to come to the Mediterranean from far far away where nothing grows. Your cuisine is thus the youngest and latest to come to the Mediterranean and have been massively influences by the Greeks and other cultures and not the other way around. Why do you think that people visit Turkey? Is it for the Turks? No it’s for the nature and Greek civilization. Do people visit the many other “Turkish” nations more to the east who still live extremely primitive and still have a very poor cuisine? Noone! It’s well documented that the ancient Greeks used filo pastry in both sweet and savoury dishes. The Mongols, Ottomons, Turks – whatever they want to call themselves knew nothing of filo pastry. With the fall of Constantinople they discovered the Byzantine gastronomy and incorporated it into their own culture. Just like the crescent moon on their flag! It was a Byzantine symbol. Tried to make it.Not happy at all!!!. First. ..kataifi a was in the oven for more than 40 min on 170° C to bake golden not 15min only as recipe said.. Custard amount is completely wrong.Should be double quantity to get nice at least 1.5cm thick layer when spread on pastry . Also way too thick and non spreadable if you cool it down first as recipe said. Very disappointed to spend all that time cooking and the whole thing end up in the bin. Great idea but totally wrong quantities. @Tanja : when i lay the filo in the base i could see my custard wasn’t enough and just doubled everything. I didn’t read the part that said pour custard after it cools so i guess i got lucky there. It’s my first time making it, still waiting to take it from the fridge to taste it, already though I’m looking to next time and how to improve, even change it up a bit. Andy- but how did it TASTE and did you use the mastic and special greek butter? I agree with VS. Not everything is Turkish! Eventhough Turkey tried to take everything! I tried this yesterday and it turned out wonderful. The other comment was helpful so I also doubled up the custard and achieved a very tasty result. I didn’t have mastic so didn’t use. Yummy result for my Indian family who also loved it. There are places where the recipe is contradictory. For e.g. the intro says “Prepare the custard over medium-low heat in order to prevent it from burning.” But the recipe says “Place the pan over high heat and bring to the boil”. Difficult to know what to do! Also, do you have to use non-stick baking dish for it to come out nicely, with all that butter? Every where i research it says it is Greek. I am German so doesn’t matter to me. I am making it for a project of cultural diversity.